Mila was never meant to learn the truth about her identity. She was a girl living with her mother in a small Minnesota town. She was supposed to forget her past —that she was built in a secret computer science lab and programmed to do things real people would never do. Mila 2.0 is Debra Driza’s bold debut and the first book in a Bourne Identity–style trilogy that combines heart-pounding action with a riveting exploration of what it really means to be human. 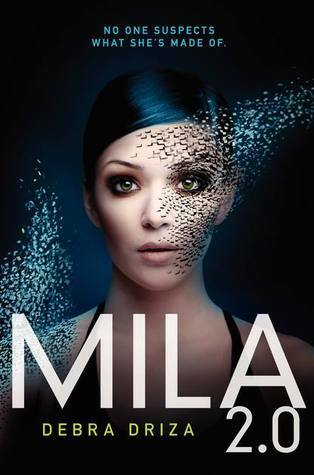 Fans of I Am Number Four will love Mila for who she is and what she longs to be—and a cliffhanger ending will leave them breathlessly awaiting the sequel. My expectations where very cautious when it came to this book. Sure, I loved the premise and the whole Bourne Identity/I am Number Four pretty much pulled me in. Yet, at the same time it made me very reluctant to read this book. I have sort of a love/hate relationship when it comes to books being compared to other books. Seriously, every time I hear “it’s the next Twilight!” or “it’s the next Hunger Games!” I cringe and really don’t feel like reading the books (even though I do). This time, curiosity won over and I’m glad it did. Mila is not your typical girl. Sure, she just moved with her mother to a tiny town in a middle of nowhere, running from the tragedy that struck her family just mere weeks ago. There Mila meets a few people that seem to take her in, trying to welcome her into the fold, and yet, something feels off. When a new boys comes to town, all bets are off. Things start to snowball, and Mila discovers more about herself and her world than she could’ve ever imagined. I thoroughly enjoyed Mila as a character. Sure, there were parts where she annoyed me a bit, parts where I wanted to high five her, and parts where I was routing for her with my whole heart. That was what made Mila a solid real character. I think that’s what I loved the most. Being who Mila is she still manages to portray the aspects of what a girl ought to be when faced with situations she faced. I loved her relationship with her mom. The ups and downs where something any teenager can relate to and I thought that was great. The romance in this book was minimal and I really have no idea where Debra wants to take Hunter and Lucas’s story, but I’m intrigued enough to want to find out more. Overall, this is an excellent debut that will literally keep you turning the pages. Debra created a heroine who’s tough and soft, loving and determined, human and not so much. This book is definitely one great ride. I can’t wait to hear what happens next! Mila 2.0 hits the shelves March 12, 2013. It’s a long wait but you won’t be sorry!